This week in the PopCult Toybox we’re going to catch up with three titans of the 1960s 12-inch action figure scene, GI Joe, Johnny West and Captain Action. 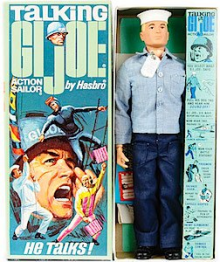 We will learn why GI Joe no-showed his fiftieth anniversary last year, the cool NEW Johnny West figure set that commemorates his fiftieth anniversary, and the very busy Captain Action Enterprises crew as they gear up for the Good Captain’s golden year in 2016. First up, with GI Joe, we have a very good interview with Hasbro’s Derryl DePriest. Mark Otnes of The Joe Report and Patches of Pride caught up with Derryl at the 2015 JoeCon a couple of weeks ago, and heard firsthand why Hasbro is focusing on other action figure lines. It’s a little sad reading the logic behind Hasbro’s moves, but it’s not hard to understand why Hasbro sees the future of GI Joe in other scales than 1/6. Collectors of 12″ GI Joe, after being a bit spoiled in the late 1990s, simply did not support collector-centric product like 2004’s Fortieth Anniversary line, and more recent attempts to revive interest in the scale failed to perform at retail. DePriest does point out that Hasbro’s “Titan” 12-inch figures with limited articulation (I panned them when they were first released) are among the best-selling action figures on the market right now. While that’s sort of depressing, it does give one hope that we will see a revival of quality 12″ action figures at mass-market retail in a few years, once the children of the 1990s are feeling the pangs of nostalgia. All is not lost for GI Joe. The Official GI Joe Collecto’s Club has four exciting new figures on the horizon. After this year’s membership figure, the glow-in-the-dark Dr. 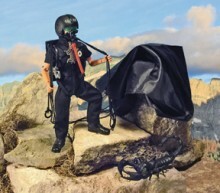 Isotope, the club will release the other two of their “missing talkers” collection, the Talking Action Sailor and the Talking Action Pilot. Each figure will say ten phrases when you pull its string–two more than the original figures said in 1967, but using actual recordings made at the time. Next year’s membership figure will be an updated version of Mike Power, Atomic Man. 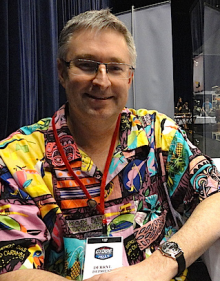 Much of the information we have comes from Mark Otnes and The Joe Report, and we want to thank him again for the great reporting he’s done in service to the hobby. Speaking of great work in service to the hobby, we’d be failing you if we didn’t tell you about Cotswold Collectibles, and the incredible work that they’re doing keeping the 1/6 collecting community supplied with figures, uniforms and accessories. If you are a fan of the original GI Joe, particularly The Adventure Team, you owe it to yourself to visit Cotswold’s Elite Brigade and see all the cool new toys you can get. 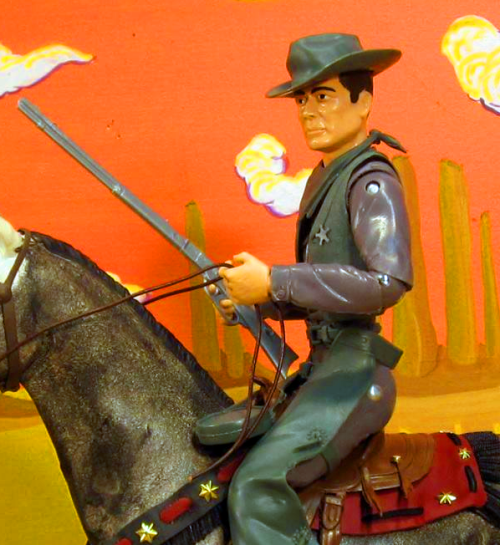 Next up we have the ole’ cowpoke himself, Marx Toys’ famous cowboy, Johnny West. 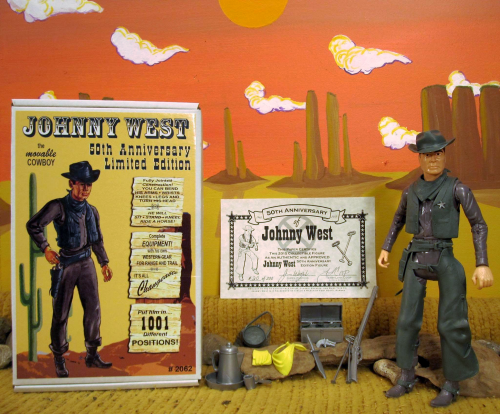 Johnny turns fifty this year, and thanks to a perfect storm of business deals, mold rediscoveries and Facebook interactions, there will be a special fiftieth anniversary Johnny West figure, made from the original molds. Actually, there already is one, I just haven’t gotten mine in the mail yet. Next week I will bring you details on how you can order this cool new version of Johnny West for yourself, but first I want to give James Wozniak of Classic Recasts, Terri Coop of Circle X Ranch (she holds the Johnny West trademarks) and Jean Zabre, whose family controls the molds, for making this project happen. After James ships out all the pre-ordered figures, these will be available to the general public. Kudos also go out to Scott Stewart of Stewart’s Attic, who helped make this project possible, and to Mykol Blackwell, from whom I mercilessly swiped the accompanying photos and who illustrated the Johnny West coloring book. I will write a detailed review of this figure once I have mine in hand, but I will tell you that Johnny’s body is molded in dark grey, as opposed to the caramel color of the original, and his soft accesories are dark teal (rather than brown). Hard accessories are silver-pewter-colored. It’s a striking color combination, one that hasn’t been seen before, and it looks like this will open the floodgates of new toys using the original Marx molds. Molds have been located for Sam Cobra and his accessories, Stony Smith, and the body of Fighting Eagle. Virgin vinyl and plastic was used, so this will be a sturdy, high-quality figure. 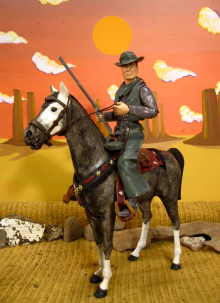 For a series of figures that hasn’t been marketed for almost forty years, Johnny West, the Best of the West and the other 12″ Marx action figures seem poised to make the most unlikely comeback since vinyl records. Lastly we come to the baby of the group, Captain Action, who doesn’t reach AARP age until next year. 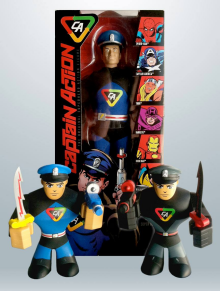 Despite retailer resistance delaying the continuation of the main Captain Action 12″ figure and uniform sets, Captain Action Enteprises is keeping the fires stoked with a ton of Captain Action products. 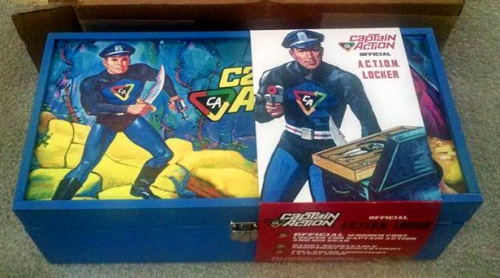 I am eagerly awaiting my Captain Action Footlocker, made for CAE by the folks at 3rd Son Books. This is a wooden footlocker, modeled after the 1960s GI Joe footlocker, with vintage graphics. I will review it in depth once it arrives at PopCult central. Likewise, I’m waiting on the C2E2 exclusive vinyl art figures from CKRTLab. Earlier this month in Chicago these cool little guys made their debut, and a full review will come your way once they show up in my mailbox. A detailed review of the Go Hero/Executive Replicas Lady Action will turn up in PopCult in the next three weeks. We will also let you know when Zica Toys begins their Kickstarter for their 4″ Captain Action and Silver Streak vehicle. 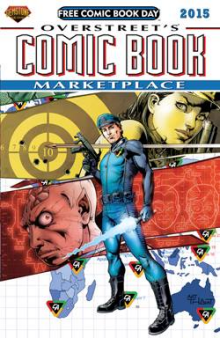 Captain Action will also grace the cover of The Overstreet Price Guide, and this Saturday you’ll find him on the cover of Overstreet’s special Free Comic Book Day edition of Comic Book Marketplace. 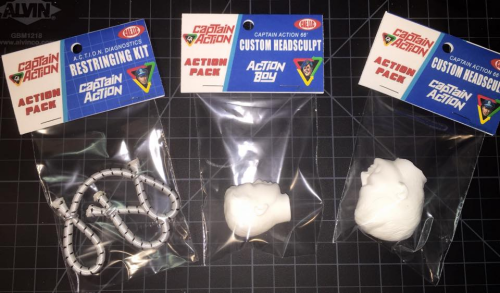 Another exciting development is the licensing deal that Captain Action Enterprises made to allow Jase Marshall, of Marshall Made Collectibles, to sell Captain Action elastic replacement kits as well as newly-sculpted custom heads that update and pay tribute to the original Captain Action and Action Boy headsculpts from the 1960s. We will alert you as soon as the heads go on sale. That’s actually a heck of a lot of activity for three toys from fifty years ago. It proves that it’s not just kids who played with these guys originally, but also younger folks who have been bitten by the bug who love these 12″ tall action figures. It’s a testament to the originality, creativity and imagination with which these cool hunks of plastic were imbued. You can expect to read more about the holy trinity of boys toys from the 1960s in the coming weeks (and months and probably longer) here in PopCult. Just wondering if you know when the JW 50th will be made available to the public and how we can purchase it? Sure you didn’t mean to say “disgusting”, there Rudy? And next year, I have to choose between the 12″ Mike Power and the 4″ Pythona from the G.I. Joe Club? Now that’s REALLY not fair! I will post the full details, probably next week. James Wozniak at Classic Recasts is selling them, and he’s got over a hundred pre-orders to ship out, so I want to give him a chance to catch up before I send more orders his way. Just keep reading PopCult for the latest news. Hey Rudy, thanks so much for the mention! James and I worked hard to get the details right and I’m proud to have done the graphics. I’ll also be selling these on my site, but supply will be limited!